Jose Mourinho will be desperate for his struggling Manchester United side to put their defensive woes behind them against the Premier League’s bottom club Fulham but the form book suggests they may struggle to do so. An exciting, if error-strewn, 2-2 draw with Arsenal at Old Trafford in midweek means United have conceded 25 goals in their 15 Premier League games to date — more than four times the number conceded by Liverpool. Alarmingly, only the division’s bottom five teams have a worse defensive record and United have managed to record just two clean sheets all season — in a win at Burnley and a goalless home draw with Crystal Palace. Even more remarkably, in the two complete seasons under Mourinho’s management, United conceded just 29 goals in 2016-17 and 28 goals last season. That leaves United facing the real prospect of overtaking those marks for an entire campaign before the turn of the year. Injuries have certainly not helped Mourinho’s cause but nor has his general tendency this season to chop and change his team selections. Against Arsenal, Mourinho made seven changes from the weekend draw at Southampton, meaning he has made a total of 46 in the opening 15 games, more than any other team. 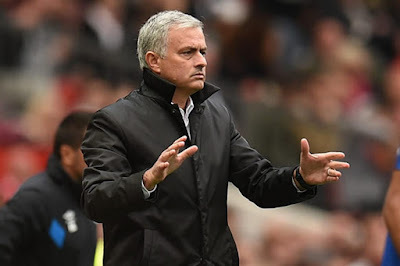 The past two games have seen Mourinho opt for a three-man defence, employing wing-backs higher up the field, although there has again been a lack of consistency in his selections. At Southampton, Mourinho opted for Phil Jones, Scott McTominay and Nemanja Matic as his three central defenders, a bold choice given two of those players are considered midfielders. Four days later, for the visit of Arsenal, Mourinho opted for Chris Smalling, Eric Bailly and Marcos Rojo, playing in the first team for the first time this season. Smalling and Bailly were both suffering from injuries while, to further add to the uncertainty in defence, Mourinho also handed a full league debut to 19-year-old Portuguese defender Diogo Dalot as his right wing-back and handed Matteo Darmian just his third appearance of the campaign on the other wing. Unsurprisingly, United’s defence looked terrible in conceding goals to Shkodran Mustafi, courtesy of a dreadful mistake by goalkeeper David de Gea, and a Rojo own goal — a defensive catastrophe that left Mourinho joking that his team had scored all four goals against the Gunners. But, given the patched up nature of his defence, Mourinho insisted he was delighted with their attitude and effort in midweek. “We have to be happy with the spirit, the effort, the dynamism, the intensity, the understanding of our difficulties,” he said. “The changes we made in the team to be more compact, with so many problems and at the back (there) was a kid with his first start, was Eric, half injured and without playing for a long time, was Smalling injured — I have to say injured. Fulham, bottom of the table and with just 15 league goals in as many games this season, should offer United’s defence a sightly easier challenge on Saturday, although the arrival of new manager Claudio Ranieri may produce a galvanising effect, at least based on their 1-1 draw with Leicester on Wednesday. United’s French international forward Anthony Martial came off early in the Arsenal game with what Mourinho described as a “pre-injury” and will have his fitness assessed before the Fulham game.